The construction of zero carbon buildings and the retrofitting of existing buildings offer some of the most cost-effective and most immediate strategies in response to climate change. Over the years we have developed a unique environmentally sound, energy efficient construction system using natural materials and incorporating 'breathing wall' construction which eliminates the need for a vapor barrier and allows the fabric of the building to interact with the indoor climate in a beneficial way. We have also experimented with straw bale construction. We developed the guidelines for ecological housing design and construction and published Simply Build Green, the UK's first ecological building manual. 125 new ecological buildings have been erected to date, built to strict ecological guidelines, with passive solar design, high insulation, and environmentally benign materials. In 2008 a visual arts center Moray Art Centre was opened serving the region with museum-quality exhibition space and several studios. With photovoltaic panels supplying electricity and ground source heat pumps supplying all heating, the arts center is considered an exemplar in local materials and craftsmanship. 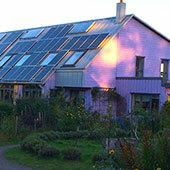 Between 2011 and 2014, Soilse, a new multi-generational cohousing carbon zero development was established. 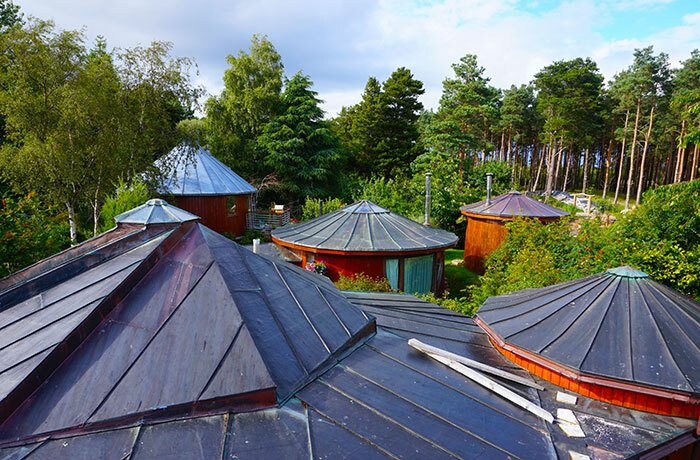 With its own biomass district heating, its super-insulated houses adopted triple glazing throughout the buildings. The co-housing was first in the UK to utilize the 425mm thick insulated block. In 2012 co-housing neighborhood East Whins broke ground in a ‘brownfield’ site, providing 20 passive solar design, highly insulated houses. 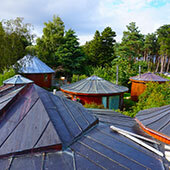 The ecovillage at Findhorn has erected 61 ecological buildings to date and there are ongoing plans for the continued construction of an ecologically respectful built environment. Over the years we have developed a unique construction system, environmentally sound and energy efficient. Using natural and non-toxic materials we have developed a 'breathing wall' structure, which allows the fabric of a building to interact beneficially with people to moderate humidity and air quality. We have also experimented with straw bale construction, the 'Earthship' system using recycled car tires, and remain open to further new and innovative ecological solutions for the built environment. 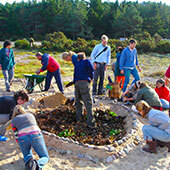 The publication of Simply Build Green, the UK's first technical guide to ecological housing, based on our own research and experience, has helped the ecovillage become a major resource for environmental education locally, nationally and internationally. 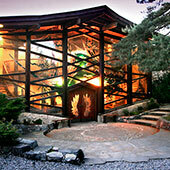 » Use of passive solar features where possible through orientation and window layout. » Use of solar panels for domestic hot water heating. » A district heating system using a gas condensing boiler for highest fuel efficiency. » Super efficient insulation (U-values of 0.2 watts/m2 C in roof, walls and floors). » Low-energy light bulbs throughout. » Triple glazing (U=1.65 watts/m2 C). » Cellulose insulation (made from recycled paper). 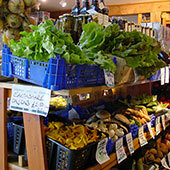 » Non-toxic organic paints and wood preservatives throughout. » Boarding manufactured without the use of toxic glues or resins. » Locally grown and harvested timber from managed forests. » Local stone for skirting, patios and pathways. » Roofing with natural clay tiles. » Innovative 'breathing wall' construction allowing a controlled exchange of air & vapor, and eliminating the need for a conventional vapor barrier. » Suspended timber floors for underfloor air circulation to avoid any possible build-up of radon gas. » Isolating electrical circuits to reduce electromagnetic field stress. » Water conservation (showers, low-flush toilets, and self-closing taps). 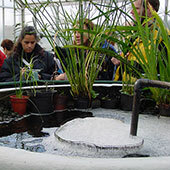 » Collection and recycling of rainwater for garden use. » Shared facilities (laundry, kitchens, lounges) avoiding unnecessary duplication.